The public debate is constantly distorted by claims that cannot be substantiated. One such claim is that the current period of budget deficits is building a stock of future claims on the well-being of the future generation – our kids. Accordingly, the neo-liberal deficit terrorists claim that the best thing we can do for the future generation is to avoid running deficits. My view is that we have been imposing a huge future burden on our children but this would be larger if we tried to run surpluses now. In fact, the years of surpluses exacted a huge toll on our children’s prospects that they will have to endure for years to come. THE spending packages of the Rudd government will be sold to national journalists as economic stimuli. But at the local level they will be used for old-fashioned pork-barrelling. There will be no mention that the projects are funded by borrowing. Once a government embarks on a program to buy votes with borrowed money, there is no limit to the process until the economic consequences catch up, and they will. But the cynics know that this could take several electoral cycles. Some may see this as a difficulty for the opposition. But in fact it is an opportunity. The public will wonder how all these local projects that the government could not afford when it did have money can be funded when it doesn’t have money. The money is being taken from the pockets of future taxpayers. The money is being borrowed and they will bear the cost. This is an intergenerational transfer from the future to the present generation. Although it is not due until 2012, the next Intergenerational Report will show how this has made life tougher for future Australians. So you see that the past Treasurer continues to mislead us all about what is a future cost and what is not. Whenever I read this sort of rhetoric I am always reminded of the legacy that he left the future generation as a result of policies he was responsible for while in Government. No better example of that than the lack of regard his government gave to youth. If you want to provide for the future generation then the things that will matter are education, employment and public infrastructure. All three are investments in the future. On all three, the previous government failed dramatically. But first the fiscal errors in the previous statement. The current government has as much “money” now as it had yesterday and the same amount it will have tomorrow. That is, it has whatever it wants to spend. It always has that. It has no more or less capacity to spend today because there were surpluses in the past than it would have if there had have been deficits in the past. Costello thinks the surpluses provided more capacity. That is plain false. I was giving a public lecture on Thursday night and on question time someone asked me whether the current government was lucky that they were able to draw down on the savings provided by the previous government’s surpluses. I explained how it is a nonsensical notion thinking that a sovereign government would “save” in its own currency. It also belies the nature of government spending and taxation. They are flows – like a river – you don’t ask how much water has accumulated as it gushes out the tap. It is gone before you know it. Various metres can record the flow but unless there is a dam to store it as a stock it flows away. Same with spending and taxation – it is accounted for but once it exits the economy – as a surplus (spending less than taxation) then it is gone for good. There is no storage shed in Canberra or Washington or anywhere else where the surpluses are saved up and available for the government to drive a truck down and pick up some dollars to spend. Surpluses destroy financial assets that were previously in the hands of the non-government sector and these assets are gone forever. Surpluses take money from the pockets of the households because the government spends less than they tax us. The idea that borrowing “takes money from the pockets of future taxpayers” is equally nonsensical. The funds to pay for the bonds originate in the government net spending in the first place. The deficits add to bank reserves and non-government entities decide that it is in their best interests to hold the net increment in wealth in the form of government bonds rather than reserves. So the government is really borrowing their own spending back! Once you understand that then the idea that there is a future burden will make you laugh. Further, the interest payments are incomes to the bond holders who presumably enjoy the return on their saving. Most will have children who will benefit from those payments. In doing so it is not providing itself with any extra revenue to help it pay its debt back. It is just adjusting aggregate demand to ensure the economy maintains price stability. There has never been an empirical relationship shown between tax level changes and debt level changes lagged however many years you like. The notion is ridiculous. So back to the costs that the future generation will bear. 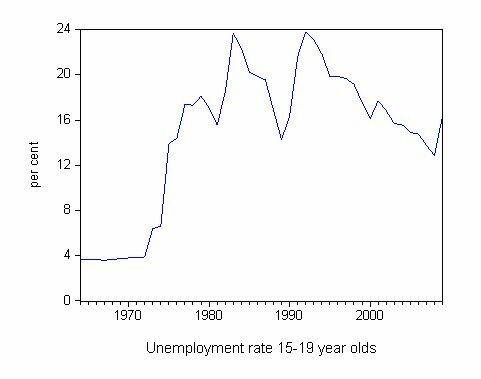 Consider the following graph which shows the unemployment rate for working age teenagers (15-19 year olds) since the early 1960s in Australia (using ABS labour force data from historical records that I have). That jump in the mid-1970s was the beginning of the neo-liberal obsession with reducing budget deficits and cutting the public sector back. Prior to that jump the youth unemployment rate was always just a little higher than the adult rate (but still low). The jump in the mid-1970s was largely due to government policy (more on this later). It is often claimed that the seriousness of youth unemployment is less than the official unemployment rate might convey. The claim is based on the observation that an unemployed teenager who is searching for a full-time job is in a different situation than an unemployed teenager seeking part-time work. The worker who only wants part-time employment to help subsidise their education (perhaps full-time education) is not considered to be in the same welfare plight as a person who has left school and is desiring to embark on their full-time labour market attachment. 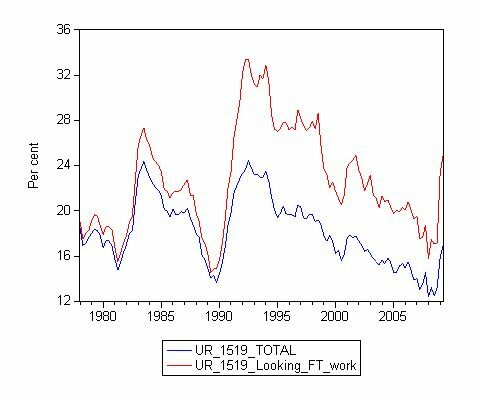 In this context, consider the following graph taken from ABS Labour Force survey data (from February 1978 to June 2009) which shows the 15-19 year old unemployment rate for all persons (blue line) and those who are looking for full-time work only (red line). While it is true that the retention rates in full-time education are rising and less teenagers overall (in absolute numbers) are looking for full-time work, the fact remains that those who do are severely disadvantaged. In the full employment era (1945-1975) there were always enough full-time working opportunities for 15-19 year olds who did not want to stay at school. They were also able to build careers and progress within the organisations they worked for. It should never be forgotten that one of the major reasons that the youth unemployment rate rose so sharply in the mid-1970s relates to the major cutbacks in the public service that began around 1975 and continued throughout the second half of the 1970s. At that point, the public service was a major employer and trainer of our youth especially in the plethora of apprenticeships that were available within the public sector. These opportunities were savaged in the early Fraser years as the neo-liberal era began. 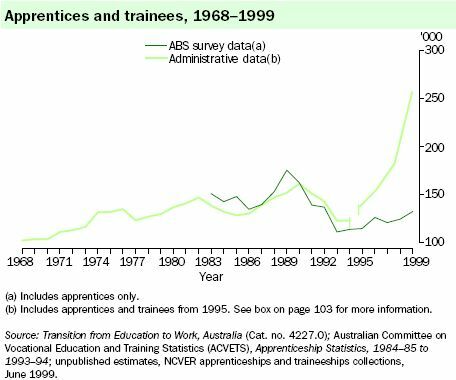 The following graph is taken from ABS Social Trends 2000 and shows the decline in the mid-1970s in apprenticeships. Privatisation and contracting out also meant there were fewer jobs and on-the-job training opportunities for young people. You can see the sharp decline in the late 1980s that corresponded with continued public sector contraction. Further, in the 1980s, the Hawke government increasingly started to offer traineeships rather than apprenticeships as the neo-liberal economists gained sway – they argued that youth unemployment was high because their wages were excessive. But the major reason that youth unemployment rose so sharply was because its major employer (the public sector) started to radically reduce the available job opportunities – all in the cause of cutting back on the public sector and pushing more responsibility onto the private market place. From 1975 onwards, there have never been close to enough jobs produced to satisfy the available labour supply. In this context, the low-skilled, inexperienced youth are towards the back of the jobless queue. Behind them are the mentally ill, indigenous and and migrant workers. What is of most concern is that we still haven’t learned the fallacy of compositions that plague an economy when there are aggregate constraints imposed on it. Increased education qualifications and training will not protect a teenager from unemployment if there are not enough jobs overall. While persons who receive higher levels of education are less likely to experience unemployment it doesn’t follow that if everyone attains higher skills levels that unemployment disappears. When there are not enough jobs overall all that happens is that education and training shuffle the jobless queue and different people become unemployed. The most significant factor influencing the employment of young people is the availability of jobs. The benefits of economic growth have not transferred into jobs for young people. Many entry level positions have disappeared. There is not evidence to suggest that young people are less job ready now, than in the past. The cause of youth unemployment cannot be found in asserted deficiencies of young people themselves, but in the economy which increasingly fails to provide them with employment opportunities. The majority of the Committee, however, has focused on rectifying the alleged deficiencies of young people. Much attention was given to the attitude of young people — the ‘youth of today’. So then you see that the current federal government has not learned the lesson either. Mark Arbib, the Employment Participation Minister has told the press that youth unemployment will rise in the coming year. Arbib is now famous for the “work experience on the dole equals a full-time job” comment he made as he stumbled to justify the unjustifiable – the PM’s claim that the Government was creating 50,000 Green jobs to further meet the crisis that is besetting the labour market. The jobs were non-existent but try getting them to admit that. So with some tinkering we heard this before when Abbott, Dutton and Andrews railed us with the job snobs and cruisers terminology. The best thing this government can do to prevent entrenched disadvantaged among our youth is to ensure they have work now. Enough work to go around at reasonable working conditions and sensible pay. Work experience while on the dole is not a job. It is a cop out by the government and it will be in these ways that the government increases the burden on our future generations. So when we are worrying about future burdens we should forget issues relating to public debt. It is clear we need an increased budget deficit now to provide enough jobs for all those 15-19 year olds who are unable to find work and who are beginning their days of disadvantage early. The long-term consequences of the unemployment are significant. Mark Arbib has a Master of Arts in Political Science and Economic History from the University of NSW. In other words he should no better and his comments can only be construed as pure evil. Yet another Say’s :aw advocate I’m sure with absolutely no grasp of reality. I have some comments regarding the line of thinking more generally (also applying probably/roughly to Mosler and Kansas City, I think). These aren’t directly linked to the tax burden issue in this post, but they cut across some of the points that are part of the recurring theme. Hope this doesn’t come across as confrontational. That’s not my intention. I like your blog, and the others, but remain fundamentally flummoxed by one general aspect I perceive in the overall approach. So here goes. I’ve at least scanned most of your posts on the main issues, as well as at the other two blogs. I agree with much of what you and the others write about the operations of a fiat system, and the fact that there seems to be a real problem with main stream economists failing to understand it. My general impression however is that in making the case you and the others are combining the correct explanation of operational capability with a near-rejection of the real world importance of balance sheet “policy” restraints or constraints. E.g. : It’s quite clear the government has the operational capability to spend ‘till the cows come home, creating broad money and bank reserves in the process. There is no operational limit. But there is a real policy concern in terms of practical balance sheet debt and the interest burdens associated with it. And in the real world, that translates to the notion of a policy limit. And a policy limit is a constraint of sorts. My general impression is that your associated school of thought tends to demote the importance of such practical constraints in order to emphasize the correct operational understanding. The constraint shows up in this example in the following ways. First, the operational capability described requires the freedom for the government to run an unlimited overdraft at the central bank. Overdraft is equivalent to credit on demand. Both are equivalent to monetization on demand. So here’s the policy reality: When was the last time you saw such a government overdraft of any size on a central bank balance sheet? I’m sure you can read my mind for the rest of the argument from there. Suffice to say, there are decisions to be made about converting that overdraft into debt issued by the government, etc. Those are policy decisions that act as constraints on the operational freedom that is the foundation of this line of thinking. The idea that debt is an interest rate control mechanism in this sense is quite nifty. I like it as a coherent model of how government expenditure relates directly to choices about interest rate levels. Ground zero for interest rate control is the Fed funds rate. But when investors buy government bonds, they make some judgement about future policy for such interest rate control. But the interest rate issue isn’t entirely endogenous to the fact of control over issuing debt; at the end of the day, it is also a function of the market’s expectations for policy – including the Fed funds rate. That influences the yield curve for government debt. So policy is a big factor once again. My sense also is that your blog and the others seem to be driven by concerns mostly about the policy errors of excessive government surplus tendencies. That’s fine. But I don’t think it’s ideal to blend that concern into the description of operational capability. My impression is that as a result some operational capabilities are exaggerated while others are dismissed. I agree in a pure operational sense, because I understand how the balance sheets that are involved work. I disagree in a real world policy sense. There is obviously an implication from these debt decisions for sustainable or unsustainable interest on debt burdens. Alternatively, there is an implication in terms of sustainable or unsustainable inflation consequences if governments and central banks choose to keep their liabilities as excess broad money and bank reserves rather than term bond debt. While there is no capacity effect in terms of pure operational capability, there is in terms of policy freedom at the margin. The fact that there is complete operational freedom in theory doesn’t mean there is complete policy freedom in practice. That is, unless you think governments can issue money or debt without limit and without other financial consequences. Governments face these policy decisions about the amount and cost of their debt and the inflation consequences of the money they produce from their expenditures. They may not understand how their balance sheets work, but nevertheless these policy questions are real. As Mosler seems to say a lot, it is scary that the people making the policy decisions don’t understand how the government balance sheet and the monetary system work. Fair enough. But this doesn’t negate the fact that these policy decisions are issues for somebody to face. You can’t just run deficits without limit and let expenditures create money without limit, even if the operational capability would allow it. And I don’t believe this line of thinking should dismiss policy concerns as a sort of corollary to demonstrating the correct operational understanding. Policy is a necessary reality. This one is different, because it’s an example an operational statement with which I strongly disagree. And I think it’s a case where a policy bias against government surpluses has influenced the operational description. I will argue that the fact that a government issues its own currency has nothing whatsoever to do with its capacity to save. Here I’ve reversed roles in the sense that I’m talking about pure operational capability before turning to the question of policy restraints or constraints. First, consider (an operationally feasible case) where the central bank issues currency by purchasing private sector financial assets, rather than by purchasing government debt. And suppose the government has run a balanced budget up to this point. Now suppose the government decides to run a surplus. Now suppose the government decides it wants to manage its books “in paradigm”. (I’m not being cheeky here; just illustrating an operational point.) So in preparations for a surplus operation, the government “prepares” its balance sheet as follows. The government purchases existing non-government assets (probably financial assets) in an amount equal to the size of surplus it intends to run. At this stage, the government has simply acted as extension of its central bank, putting more money into the system by acquiring existing assets. So the government balance sheet, separated from but connected to the central bank balance sheet, shows non-government assets acquired and an overdraft at the central bank. The government in this example has saved. It has a surplus flow in the form of taxes, equivalent to a corresponding reduction in discretionary income (and saving) for the non-government sector. It has saved. And I’ve shown that it shows up as equity or accumulate saving in the proper economic balance sheet sense. There is absolutely no question about it. Such government saving is an operational possibility just as legitimate as any of the operational possibilities you suggest in order to make your case in other areas. This government surplus position creates a net non-government deficit in the sense of the Kansas City sector financial balances model. The SFB model is defined relative to netting out investment from the non-government sector balance sheet. So the government surplus in this case serves as an offset and partial match for investment, equivalent to the shortfall in non-government saving. (I’m afraid to use the word “funding” here, for fear of being excoriated for false causality. That’s another unfortunate perception problem I won’t get into here – the idea that words previously associated with an improper operational model retain a patina of ineptitude if not criminality when used in association with the correct operational model.) That partial offset to investment again proves the existence of saving. A red herring threatens beneath all this. It doesn’t matter at all that the government acquisition in this case is a stock (i.e. existing asset) as opposed to a flow (i.e. real GDP component) purchase. I.e. it doesn’t matter that it is simply an exchange of newly created money (or bonds asset) for an existing real or financial asset. All that matters is that I have created the capacity for a government balance sheet equity position, and I’ve even done so by remaining “in paradigm”. I.e. The acquisition of assets has created its own (money) finance, and taxation has withdrawn money and reserves from the system, in the process creating the actual equity position. And finally we can ignore from an economic perspective the fact that governments tend to misclassify outlays as between expenditures and investments or financial assets. Such misclassification is a non-issue in terms of the true economics, and the true identification of government saving or dissaving. Moreover, all this has absolutely nothing to do operationally with the fact that the government issues its own currency when it spends. To be sure, the issuance of currency allows expenditures and deficits to be offset operationally with money creation. But money creation doesn’t require deficits. Just look at my example again where the central bank creates money by acquiring non-government assets and the government acquires additional non-government assets in generating an ultimate surplus. Similarly, when the government runs a budget surplus and pays down pre-existing debt (representing cumulative prior deficits), it saves. This is no less saving than if somebody in the non-government sector uses their saving from income to pay down a credit card balance. The fact that somebody has a net liability position has nothing to do with whether or not it’s possible for them operationally to save. The fact that governments tend to run chronic net liability positions similarly has nothing to do with their operational capacity to save. From a policy perspective, that saving affects a governments ability to borrow in the future. There is less debt on the balance sheet, and less debt servicing interest costs. Obviously this isn’t the case from an operational perspective, which is your ongoing point. Neither is there when I save to pay down my credit card debt. This example embodies a consistent distinction between stocks and flows. Saving is a positive flow. Nothing about starting with a negative stock disproves the capacity for a positive flow. (With all due respect) so what? The same goes for my credit card company when I save to pay down my balance. Is this an operational point, a policy point, both, or neither? It appears to be a truism operationally, and from a policy perspective what’s the problem with paying down a little debt once in a while? And from a policy perspective, where’s the logical and mathematical dividing line between running a deficit that is less than infinity and running one that is occasionally less than zero? Who made up that rule and exactly what is it? Absolutely – that’s what taxes do. I put the same sort of question as with the previous example.